More than 12 million Americans have thyroid disease. If you’ve be diagnosed with thyroid disease, you might be wondering if there is anything you can do to help your condition besides taking your medication regularly. Eating a healthful diet, which includes lots of fruits, vegetables, lean protein, whole grains, and fish oils will help with improving or maintaining thyroid function. While you may have heard of taking fish oil for its cardiovascular benefits, it also affects many other bodily processes, including possibly thyroid function. Fish oil contains omega-3 fatty acids, which your body does not produce and must get from food. Omega-3 fatty acids help decrease inflammation, increase immunity, and may affect gene expression. Fish oil is a better source of omega-3 fatty acids than plant-based sources like walnuts and flax seed. While the strongest evidence for fish oil is for heart disease, there is also some evidence that suggests fish oil may increase thyroid hormone uptake - good news for those with hypothyroidism. In a study published in the "Journal of Nutritional Biochemistry" in 2010, rats received diets containing either soybean oil or fish oil. The author, Souza, found that thyroid hormone receptors and enzyme levels involved in thyroid hormone uptake were higher in the fish oil group. Fish oil can also reduce inflammation, a cause of hyperthyroidism. Recommended dosage of fish oil is 1 to 4 g. This is based on typical the fish oil dosage for cardiovascular benefits. You can find fish oil in most pharmacies or grocery stores. Or, if you don't like taking pills, you can eat fatty fish like salmon, mackerel, sardines, or albacore tuna at least twice a week to attain the proper dosage. Some fatty fish may contain high levels of mercury and environmental contaminants, especially those that are farm raised. Most salmon sold in the U.S. is farm raised, and farm-raised fish do not have as many omega-3 fatty acids to benefit your thyroid. To minimize exposure to mercury and environmental contaminants, choose wild fish and eat a variety. 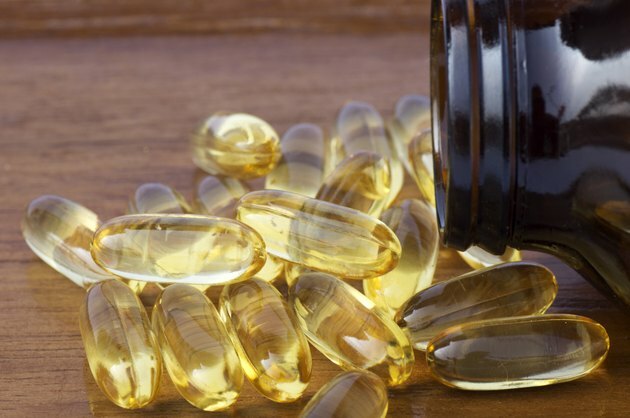 According to MedlinePlus, fish oil is safe for most people when taken in low doses (3 g or less per day), but don’t take more than 3 g of fish oil unless you talk to your doctor. High intakes could cause excessive bleeding in some people, especially those taking blood-thinning drugs like Coumadin.